26 Sept. 2018, New Delhi: Verdict of Supreme Court of 4 Judges of the 5-Judge Constitution Bench on biometric data based 12 digit Unique Identiﬁcation (UID) number branded as Aadhaar is manifestly unscientific and anti-poor. The verdict was delivered today. It has taken citizens to pre-Magna Carta days (1215 AD) or even earlier, to the days prior to the declaration of Cyrus, the Persian King (539 BC) that willed freedom for slaves. UID/Aadhaar is akin to to Sanjay Gandhi's forced family planning programs. Even Sanjay Gandhi faced the adverse consequences of forcing planning on human body. Aadhaar-linked programs make Indian citizens subjects of Big Data companies. Before going through the 1448 page long verdict, Citizens Forum for Civil Liberties (CFCL) submits as a initial reaction that this opening statement in the order is questionable from scientific point of view. A report “Biometric Recognition: Challenges and Opportunities” of the National Research Council, USA published on 24 September 2010 concluded that the current state of biometrics is ‘inherently fallible’. That is also one of the findings of a five-year study. This study was jointly commissioned by the CIA, the US Department of Homeland Security and the Defence Advanced Research Projects Agency. A report “Biometrics: The Difference Engine: Dubious security” published by The Economist in its 1 October 2010 issue observed “Biometric identification can even invite violence. A motorist in Germany had a finger chopped off by thieves seeking to steal his exotic car, which used a fingerprint reader instead of a conventional door lock.” Notwithstanding similar unforeseen consequences Prime Minister’s faith in biometric remains unshaken. It seems that considerations other than truth have given birth to this faith. Is there a biological material in the human body that constitutes biometric data which is immortal, ageless and permanent? Besides working conditions, humidity, temperature and lighting conditions also impact the quality of biological material used for generating biometric data. UID/Aadhaar is based on the unscientific and questionable assumption that there are parts of human body likes fingerprint, iris, voice etc” that does not age, wither and decay with the passage of time. Stalwarts like Justice V. R. Krishna Iyer, a people’s judge of the Supreme Court, S R Sankaran, a people's bureaucrat and K. G. Kannibaran, author of The Wages of Impunity had opposed biometric UID/Aadhaar and Unique Identiﬁcation Authority of India (UIDAI). Their views were endorsed by the Parliamentary Standing Committee on Finance. The dissenting order of Justice Chandrachud echoes their views. 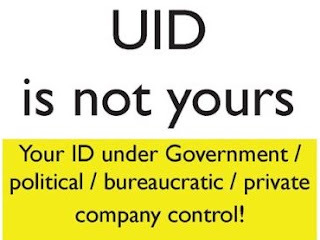 The Bhartiya Janata Party led Government like the previous Congress Party led Government has been bulldozing the Unique Identiﬁcation (UID) /Aadhaar number database project down the throat of citizens. Before their death Justice Iyer, Kannabiran and Sankaran issued a Statement of Concern against the biometric UID/aadhaar number in September 2010 along with fourteen other eminent citizens. The Statement of Concern reads: “The project that proposes to give every resident a `unique identity number’ is a matter of great concern for those working on issues of food security, NREGA, migration, technology, decentralisation, constitutionalism, civil liberties and human rights....This project is intended to collect demographic data about all residents in the country." It further reads: "The involvement of firms such as Ernst & Young and Accenture raise further questions about who will have access to the data, and what that means to the people of India." Majority verdict of the Supreme Court has missed the opportunity to save Indians from the dictator ship of anonymous donors who have compromised national security and almost all the public institutions. Citizens Forum for Civil Liberties (CFCL) used this Statement of Concern to launch its campaign for freedom from UID/Aadhaar in 2010. Since it has been demanding stoppage of biometric and demographic data collection for the UID/Aadhaar project. CFCL is involved in the research and advocacy against surveillance technologies like UID/Adhaar and DNA profiling. It had appeared before the Parliamentary Standing Committee on Finance that questioned and trashed the biometric identification of Indians for UID/Aadhaar.